England's Serena Guthrie is set to make a one-off appearance for her local side in Premier League Two this weekend. Jersey-born Guthrie, 25, will be part of the Team Jets line-up for their clash with Dartford-based Telstars. 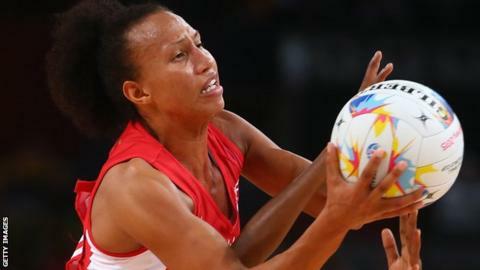 She helped England to World Cup bronze in August and is visiting home before she returns to New Zealand to play for Auckland's Northern Mystics. "I'm back for a few weeks and any hand I can have in helping the Jets win would be great," she told BBC Jersey. Team Jets have had an impressive rise up English club netball's ranks, winning promotion to the second tier via last season's play-offs. "All those girls are my friends, we've been through a lot both on and off the court growing up together, so it'll be really fun to get out there and play with them for a bit," said Guthrie. And the island side can certainly do with Guthrie's help, having won just two of their opening seven matches. "I've played in that league when I was younger and it's a tough league," the former Team Bath centre or wing defence continued. "They are playing within the top percentile of the country so it is tough, but they'll learn so much from it. "I'm sure they'll be looking to stay in the league and develop and bring their young players through and get as many people who are interested in playing for the Jets and want to play for them to experience that level of netball." Guthrie will then return to Auckland for her second season as a professional with the Mystics, who play in the ANZ Championship against the best sides in Australia and New Zealand. "It's great to see not just how big the sport is, but how they treat their female athletes over there," she added. "I feel like everyone in Jersey's very supportive of me and my netball and people recognise me in the street, but in New Zealand it's ten-fold of that. "It's hard to get used to, but as you get into the competition you start to realise that people are just genuinely interested in netball, which isn't widespread yet throughout the UK, so it'll be awesome if the UK could go that way. "Last season we finished as the top New Zealand team in the competition and managed to get ourselves through to the semi-finals. This year we want to go one better and get ourselves into the Grand Final."